Julie's Creative Lifestyle: Wordless Wednesday - I Love Yarn! I love yarn and these bright colors remind me of Spring! I bought this cotton yarn last year in the Lion Brand Yarn Studio and I think I might crochet some dishcloths soon. Just seeing brilliant, vivid shades no matter what of then I get all giddy inside. Great WW pix! How pretty! It does feel like Spring! I used to like to go through my grandma's yarn bag. :) Those colors are nice for Spring. I am not crafty, so I admire your talents & skills! I'm looking forward to see your finished products with that gorgeous yarn. I love bold colours. Oh Julie, your photo is simply yarnalicious! I've been trying various cotton yarns and think I have found a favorite brand, however, I've not tried Lions Brand cotton yarns. It will be months now before I have the chance. Hope to see you at the It's Finally Friday Link-a-Long beginning tomorrow! I love the color display. So fun! Wow, just look at this beautiful display of bright coloured yarn .... I love yarn too, I love your yarn, I love everyone's yarn, oh help I'm a yarn addict! Oh Julie, These lovely yarn colors make me drool...:) So beautiful!! 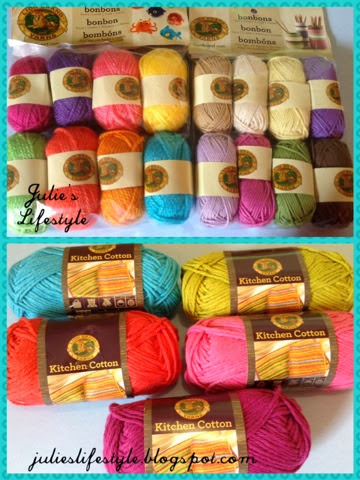 © Julie's Creative Lifestyle: Wordless Wednesday - I Love Yarn!